As you’d expect, people associate skiing with the winter season. It makes sense, since skiing tends to take place atop snow-capped mountains. However, skiing definitely happens during the summer period. Many ski resorts play home to a high altitude glacier where a lot of summer skiing takes place. Our guide (courtesy of Alps2Alps) will dive into our best spots for glacier skiing in the Alps. Who said the slopes were only for winter? Glaciers are formed when large masses of snow become compact and turn into ice. This is perfect for snowfall, as the snow can settle and is less likely to melt. At high altitudes especially, the year round snowfall means the ice will be consistently replaced, allowing snow to continue settling. These are ideal conditions for skiing. The worst situation for any holiday-goer is arriving at a resort later in the season and seeing a distinct lack of powder. 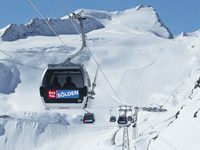 Glaciers are therefore very popular for summertime skiing – many of them, as you’d expect, are situated at some of the highest ski resorts in Europe. With guaranteed snow coverage and great ski conditions, your ski trip needn’t stay confined to the winter season. To kick-start our list, we begin with the Klein Matterhorn, which is often referred to as a “Glacier Paradise”. 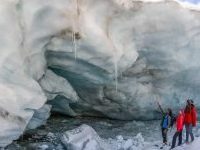 Zermatt itself is already renowned for its excellent slopes and reliable snow conditions, so it’s no surprise its home to one of the best glaciers Switzerland has to offer! Skiing is available all year round, attracting professionals and freestyle skiers alike. Professionals use the glacier to maintain and hone their skills through the summer, while the snow park is built for those looking to experiment. 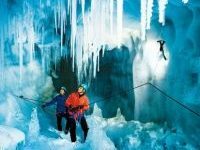 For the casual visitor, you’ll be surrounded by a range of skiers, and may end up side by side with a famous face or two. At altitudes up to 3,250m, Hintertux stands as one of the highest ski resorts in Austria. 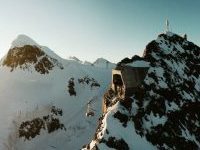 The Hintertux Glacier itself provides roughly 60km of slopes for a range of skill levels and age groups, and offers some of the best skiing in Europe. There’s something for everything at this resort – despite its stature, it’s not geared for one particular audience. In fact, its accommodating slopes are likely part of its wider reach. Open all year round, there are opportunities not only for skiing, but also hiking and relaxation, offering trails with incredible views, and excellent onsite food services. You may also like: What Is It Actually Like to Go Skiing in Summer? The Pitztal Glacier is located at the edge of the Mandarfen resort, and is said to be the highest ski area in Austria. With great lift access and some of the best snow in Europe, this is definitely one for the bucket list. Running through the early summer months, the resort is home to scenic walking trails, and plenty of accommodation, all with easy access to the glacier. Head to one of the highest points in Austria and experience it for yourself! When it comes to summer skiing, Tignes is an excellent choice. 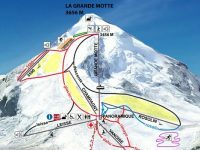 Tignes is one of the highest ski resorts in France, its home to La Grand Motte Glacier, which in itself contains 20km of pistes, meaning there’s no shortage of skiing at this French resort. Get in a good night’s sleep so you can rise early, hit the glacier slopes, and maybe try out the snow park to flex your newfound skills. Once you’re done for the day, relax at Le Panoramic Restaurant and enjoy both the food and the stunning Alpine views. Solden holds an extra special spot on this list, with two linked glaciers under the names “Rettenbach” and “Tiefenbach”. These perfectly groomed slopes are an amazing attraction for avid skiers and newcomers alike. Both glaciers are perfect counterparts to each other. Tiefenbach has gentle and far-reaching slopes, making it the ideal starting ground for beginners. Rettenbach boasts rougher terrain for the more advanced skier. The glaciers are both connected through the Rosi Mittermeier Road Tunnel, making it easy to transfer between the two. Located in the Zell Am See-Kaprun region and boasting excellent snow conditions, the Kitzteinhorn Glacier is ideal for off peak skiing. Known for its sun soaked aesthetic during the early summer months, the glacier can be reached by a number of impressive hiking trails. 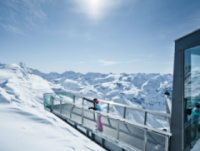 The mountain top also contains the “ICE Arena Kitzsteinhorn” – an adventure world with slides, snow beach and ice bar! Perfect for family trips and relaxing when you’re off the slopes. The Saas-Fee resort in Switzerland hosts a glacier standing tall at 3500m. The high altitudes mean snow is guaranteed throughout the summer, with more than 20km of runs open for all visitors to enjoy. The resort grants easy access to the glacier as well as a variety of runs, catering to both newcomers and the more experienced among us. 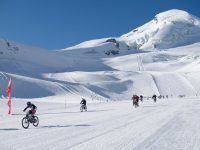 The Sass-Fee is also hosting The Glacier Downhill Bike Race which is a spectacular bike ride with speeds up to 140 km/h! Les Deux Alpes is one of the most famous ski resorts in the world. Rightfully so – it’s vibrant, festive and is home to the Glacier du Mont de Lans. The glacier sits at an altitude of 3,600m, giving it the “real snow guarantee” for holidaymakers. There’s no reason to forget about skiing after winter when places like this exist! Being attached to a top tier ski resort only works in the glacier’s favour – the resort itself is stylish, family oriented, and very international, making for an incredibly festive and vibrant atmosphere throughout! Ready for Some Glacier Skiing? At this point, we’re pretty certain you’re in the mood for skiing this summer. 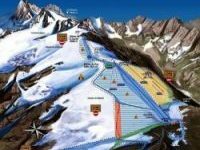 So pick your glacier, book your transfer with Alps2Alps to get your holiday off to the best start possible, and enjoy some of the best ski resorts in Europe!